Last year, Bestival was the final festival on my circuit, which finally came around at the beginning of September. Headliners included Duran Duran, Underworld, The Chemical Brothers and Missy Elliot, as well as other big names including Boy Better Know, FKA Twigs, Skrillex and Charli XCX. Just like every year, this four day shindig takes place on the Isle of Wight, is a celebration of all art forms and genres, and has tickets available for around the £200 mark. 2015 was my first experience of Bestival, and it’s one of the best festivals I’ve been to. It has an organically chilled vibe with an at-ease aura; you won’t meet many ‘wrong-uns’ here. Unlike a lot of festivals, particularly the likes of Glastonbury, Bestival is happy to enlist big name sponsors, and somewhat surprisingly, this is an absolute blessing. £1 for cans of drink or a bottle a water, a cheeky Nando’s 24/7, emergency camping supplies from Halford’s, with a lot of money coming via sponsorships, Bestival is hands-down one of the best festivals for value for money. It’s also worth noting that the festival is four days long as apposed to the standard three, so there’s not only an extra day of acts, but also a fourth headliner. Bestival does a fine job of providing both live acts and DJs. From the always-reliable Bastille, the legendary Damien ‘Jr Gong’ Marley, Wiley’s grime posse via Eskimo Dance, all-energy rockers Wolf Alice, and the popstar charms of Katy B. Bestival is consistently one of the best festivals for providing variation. If electronic music is more your thing then you’re also in for a treat, with no stone left unturned across Bestival’s expansive 2016 lineup. Hospitality continue to dominate the festival circuit with a star studded selection of drum and bass heroes, Shy FX returns once more with his renowned Party On The Moon, David Rodigan throws it back with his legendary Ram Jam, with techno house legend Richie Hawtin also booked in to perform. 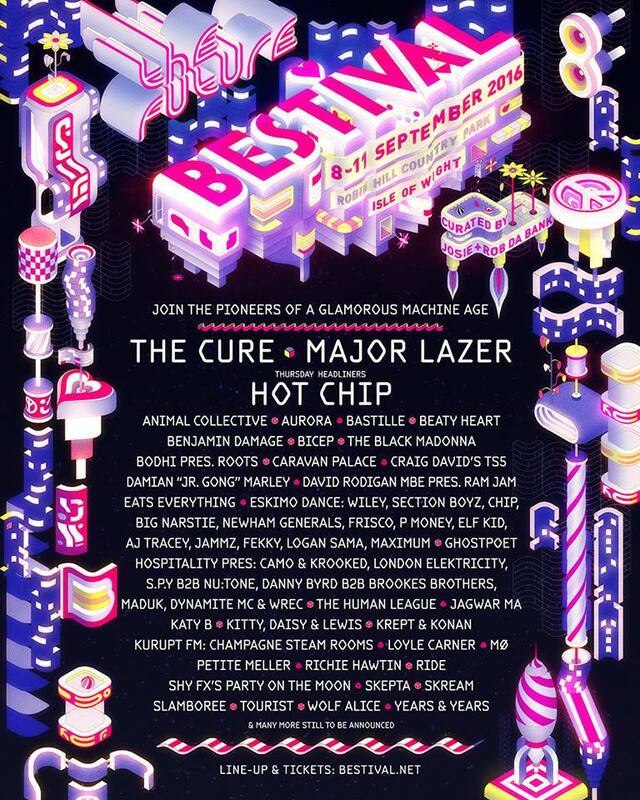 Bestival is an essential UK festival, and 2016’s lineup gives me no reason to change my opinion. Thanks to a naturally chilled atmosphere filled with good vibes and good people, Bestival was already one to consider without its hugely diverse lineup. As Rob Da Bank and co. will tell you themselves, the future is here.